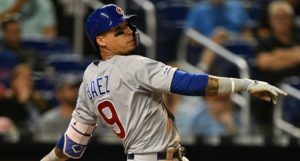 This season, like most seasons under Joe Maddon, the Chicago Cubs are expected carry eight relievers in their bullpen. And when the rare day comes that everyone is healthy at the same time, that full-strength bullpen might look something like this. Unfortunately, as of right now, it remains possible that each of Brandon Morrow (elbow), Pedro Strop (hamstring), Xavier Cedeño (wrist), and Tony Barnette (shoulder) could miss time right out of the gate. That could leave as many as four open bullpen jobs when the Cubs break camp and head to the regular season in about a week, which, woof. Now, of course, some of those absences might be easy to fill with obvious, but apparently squeezed-out big league guys like Tyler Chatwood, Brandon Kintzler, and Brian Duensing, but it seems more likely than not that there’ll be a true opening for someone unexpected to win a spot. 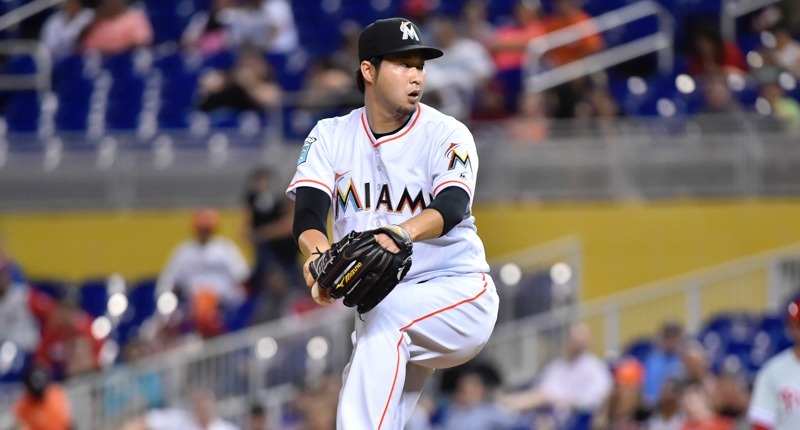 And maybe that someone will be this year’s Spring Training in-on-a-minor-league-deal-darling, Junichi Tazawa. Tazawa, 32, has yet to surrender a run this Spring, and has managed to allow just two hits, no walks, and has recorded nine strikeouts. When we say Spring Training stats don’t matter, we mean it … but we mean it more for guys already locked into a spot on the Opening Day roster. Spring battles obviously do happen and while a player’s performance on the field is just one part of the broader study, it’s not inconsequential. However you slice it, this is going to get some attention: 5.2 IP, 2H, 0ER, 0BB, 9Ks. Of course, it’s not like Tazawa is some unknown reliever, either. From 2012-2015, he was quite valuable for the Red Sox. 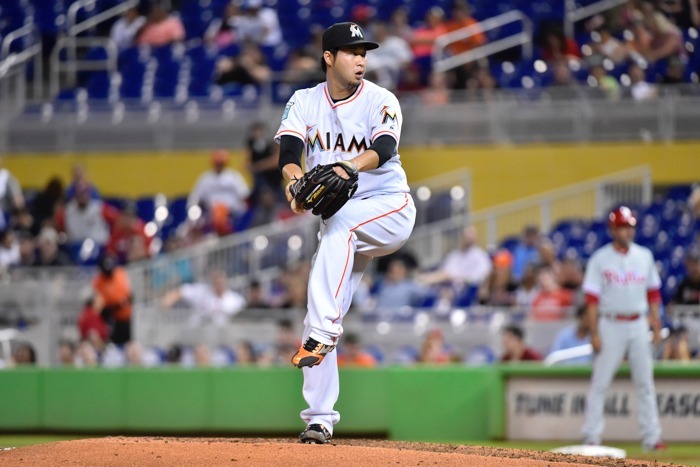 Tazawa began last season with the Miami Marlins, but was released after posting a 9.00 ERA through his first 22 appearances. 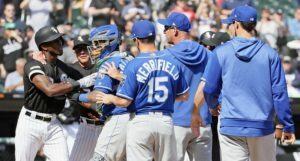 He managed to sign a Minor League deal with the Tigers, but made it barely a month before being released. The Angels then picked him up, and he tossed another 8.0 innings of big-league ball in September, but despite solid results (2.25 ERA) he arguably wasn’t actually pitching well (11.4% strikeout rate, 8.6% walk rate, 4.91 FIP). Indeed, the entire 2018 season was mostly lost for Tazawa, except, of course, when he was pitching against the Cubs, because of course: 5.0 IP, 1ER, 2BB, 6Ks. What was once a strength has exploded into a liability. And as Tyler Chatwood can attest, you can do a whole bunch of things of right, and still fail miserably if your command isn’t there. 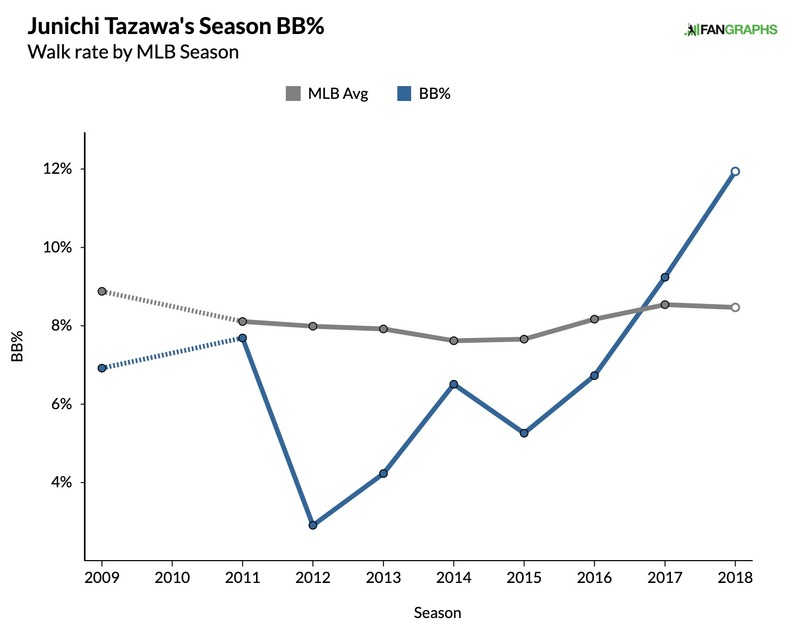 Now, Tazawa’s strikeout rate, by contrast, took a bit of a dip in the middle of his career-downturn, but actually snuck back up near the league average last season. Although he may never return to the above-average K-man he was in the past, I don’t necessarily think that, in isolation, will be his undoing. And for whatever it’s worth, he’s struck out 9 batter of the 20 batters he’s faced this season (45.0 K%), while walking none. Along a similar line, Tazawa’s ground ball rate has been trending down since its peak in 2015, but even then (40.3%), that wasn’t really the most critical part of his game. So, like his strikeout rate, I don’t really expect a low GB-rate to be his undoing. 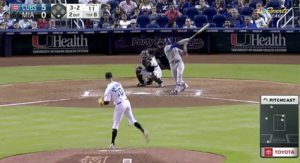 Some pitchers succeed in very specific ways and while there’s certainly a statistical floor beneath which no pitcher can survive, I just don’t expect ground balls – again, in isolation – to be his problem. As for his contact management, well, it’s been trending in the wrong direction for a while now – and that isn’t good, combined with everything else we know, but he was never really a master in this area, either. So, in short: While Tazawa could benefit from improvements in his contact skills, GB-rate, and strikeout rate, none of those will be the key to his success. His command could play a bigger role than most, but we still need to dig a level deeper to find the true root of his sharp career turn. The evaporation of good results lines up pretty perfectly with his drop in fastball velocity. And despite that drop-off, Tazawa has used that pitch about as much as ever. At the height of his career, according to Pitch Info, Tazawa was throwing his fastball between 94-95 MPH. But last season, it dropped all the way down to 92.0 MPH on average. I doubt pretty sincerely that – at age 32 – he’ll ever reach those mid-90s levels again. BUT there is a sprinkle of good news here. 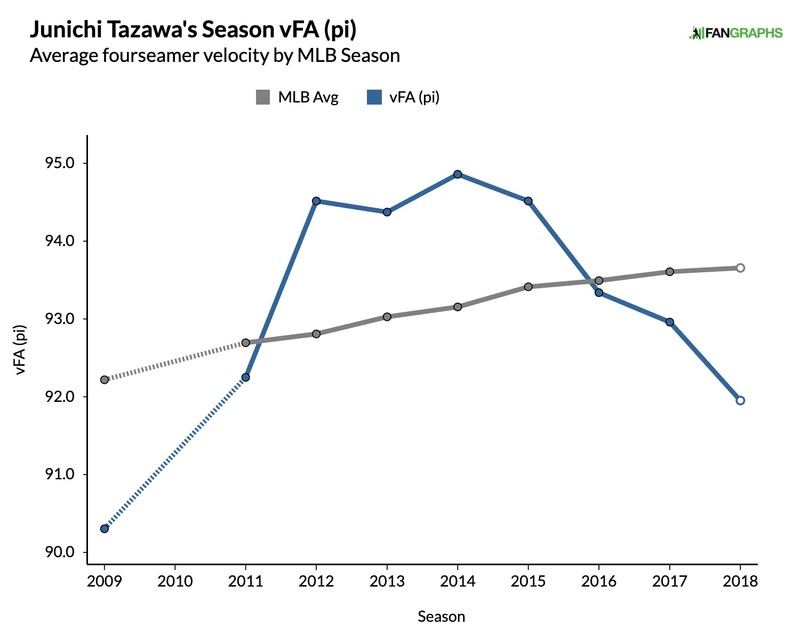 In 2018, Tazawa averaged 92.0 MPH on his fastball – a pitch he used 57.0% of the time – and that resulted in a -6.1 pitch value (140th among 151 relievers … yikes). In 2017, however, Tazawa averaged 93.0 MPH on his fastball – a pitch he used 56.8% of the time – and that resulted in a 5.5 Pitch Value (42nd among 155 relievers – not bad!). So it seems as though that one extra click may be pretty crucial to Tazawa’s fastball effectiveness, and given how often he throws it, to his effectiveness as a reliever in general. And given that the rest of his arsenal (sinker/split finger, slider, curveball) have always rated around average or worse, the importance of his fastball may truly be the key. Relatedly, you should know that Tazawa has carried pretty significant reverse-splits for his career (.306 wOBA versus lefties, .337 wOBA versus righties), but that gap has widened even further since his fall from grace. It remains quite likely, then, that his fastball velocity is crucial to his success against righties, and, thus, overall. So if he’s going to be a threat to make the Cubs out of Spring Training this year, we’ll want to see Tazawa’s command improve and his fastball velocity to sit *at least* in that 93.0 MPH range (we don’t yet have any readings for him from Spring Training). If he can manage both of those, his success against right-handed hitters should improve, and he might just be able to be something closer to the guy he once was.